Pat came into my life on a cold January night in 1975 when out of sheer curiosity, I found myself in Alumni Gym on the campus of the University of Tennessee. I was a senior at UT and part of a non-capacity crowd of 53 people on hand to watch a basketball game between the “Lady Vols” and Middle Tennessee State University. It wasn’t the first “girls’ basketball game” I had ever attended. I had grown up watching girls play high school basketball in West Tennessee. But the game I saw that night in Alumni Gym wasn’t a “girls” game. It was a women’s game. The girls I had grown up watching play high school basketball were not allowed to use full court presses or fast breaks. They were in fact only allowed to play half-court games. Six girls to a team, three on offense and three on defense with half the girls just standing on one side of the court at any point during the game. Back in those bad old days, it was assumed that female basketball players were delicate flowers of the south who could never run from the baseline to the basket at the opposite end of the court. But the game I witnessed that night between the Lady Vols and MTSU featured coeds who played just like men with two exceptions. First, they couldn’t dunk the ball. Second, they could actually make free throws. I was very close to Pat that night. Literally just a few feet away. With only 53 fans in attendance, you could sit right behind the Lady Vols’ bench. I watched as this country gal from West Tennessee won basketball games. Over 1,000 of them. I watched her win national championships. Eight of them. And along the way, her players did something even more impressive than winning national championships. They kept graduating from the University of Tennessee. Not just some of them or even a lot of them. All of them. 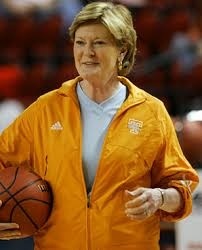 Pat had a 100% graduation rate during her nearly 40 years of coaching basketball at the University of Tennessee. A few of her players either dropped out of school or transferred, but every woman who played for her for four years graduated. Every single one of them. Like a lot of laws, Title IX was simply words on a piece of paper. But Pat made those words come alive, first in the courtroom, and then on a basketball court. In the process, she did more than win basketball games and national championships. She changed the lives of millions of American women, literally opening the doors of sports arenas to them so that they could enter not just as fans, but as athletes. Don Sharp(Uncle Hugh's UT bud): Bill: Great memories. I too was an early fan of pat and UT women's basketball, but from a distance. I was living in Augusta for the first National Championship and listened to the game on the radio with continuous static as loud as the announcer driving the rest of the family nuts. I had the privilege to meet Pat(and Holly) on their recruiting trip to the Georgia High School state championships about 5 years ago. What a wonderful classy LADY. She will be missed! Jack greiner: Bill, what a great piece. I really think Title IX was one of the most impactful pieces of legislation in my lifetime. But it took women like Pat Summit to make it come to life. Steve Smalling: Nice article, Bill. By all accounts, she never let fame and fortune change her. I remember when she involved in trying to get half-court basketball ended in Tennessee, but I did not realize that her role was testifying in a court case. Now I watch these high school girls run up and down the court, and I can't imagine it being any other way - though I remember when it was. buck wellford: This was great, and right on point Bill. Graduating 100% of four year players and as I understand it, one third of her graduates having coaching careers of some sort for at least some of their working lives, are the most remarkable accomplishments I have ever heard of. (Or is it, since I attended Vanderbilt, "of which I have heard" --- Inside Joke #34).